Eight women from Bainbridge Island and Seattle took the top price in a race from Washington to Alaska. A team of eight women from Bainbridge Island and Seattle finished first in the Race to Alaska, an annual nonmotorized boat race from Washington to Alaska. 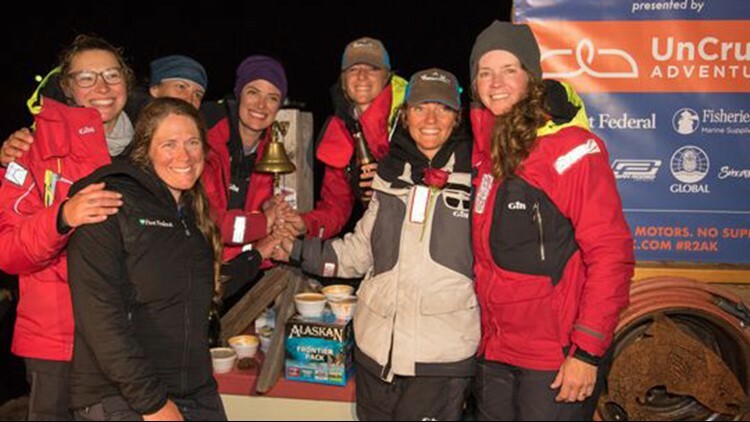 Team Sail Like a Girl arrived in Ketchikan, Alaska, just after midnight Sunday and claimed the race’s top prize: $10,000 in cash, nailed to a tree. 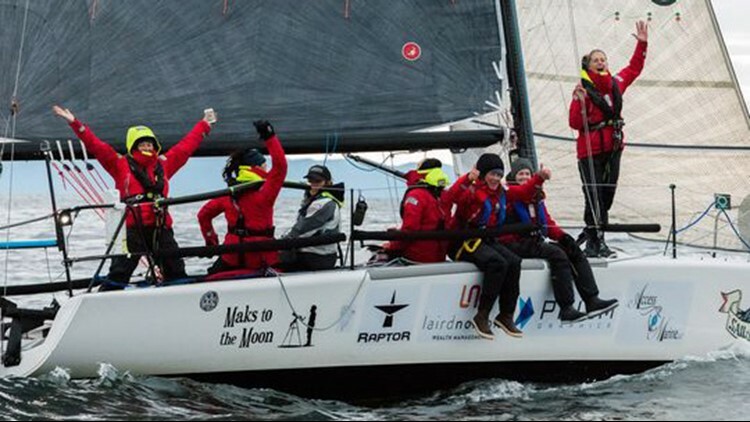 The team, which included five women from Bainbridge and three from Seattle, finished the race in six days, 13 hours and 17 minutes. Of the crew, Goussev, Aimee Fulwell, Allie Dvaladze, Kelly Danielson and Haley Lhamon are from Bainbridge. Morgana Buell, Kate McKay and Anna Stevens are from the Seattle area. The Race to Alaska challenges teams to get from Port Townsend to Ketchikan, a roughly 750-mile trip, without a motor or outside support. In past years, teams have attempted the trek through the Inside Passage in everything from highly-specialized racing boats to stand-up paddleboards. Gousseve, who has 20 years of racing experience, brought the team together from women she knew in the sailing community and friends from Bainbridge who volunteered. When they signed on, three of the eight crew members had never sailed before. The team’s boat, a Melges 32 modified with pedal-drives attached to a propeller, had been purchased second-hand from California in January and completely rebuilt. In the months leading up to the race, the women would get the boat on the water three to five days a week. Goussev taught navigation at her dining room table. Team Sail Like a Girl battled strong currents, heavy fog and fluctuating winds on the way to victory. The first few days were blazing hot with little wind, and crew members took turns pedaling the boat. But winds could pick up in a moment, Goussev said, and often did. Thick fog made navigation difficult. While the team could use GPS to identify commercial vessels, smaller boats without a tracker seemed to appear out of nowhere. Disaster struck in the early hours of Thursday morning, when the Melages slammed into a twenty-foot log north of Bella Bella. The obstacle lodged under the boat’s keel and brought the vessel to a halt. “We were going six knots when we hit it and it was like being it a car crash, we stopped dead in our tracks,” Goussev said. Working in the dark with flashlights, the team worked to bail water out of the boat and check for any damage or leaking. Progress slowed to a crawl. By the next day, team members had resigned themselves to not finishing in first, Goussev said. As they pushed on, a rare sliver of cell service allowed them to check the race tracker, which showed Sail Like a Girl still at the front of the pack. “It feels like every epic experience has that moment of challenge and for us that moment of challenge was the log,” Goussev said. More than the victory, and the cash, the trip brought together eight women who mostly hadn’t known each other beforehand. Sailing experience doesn’t matter in a crisis, Goussev said. “We pulled together as a team and supported each other and supported the boat and we tackled that issue in a way that I am really proud of,” she said. 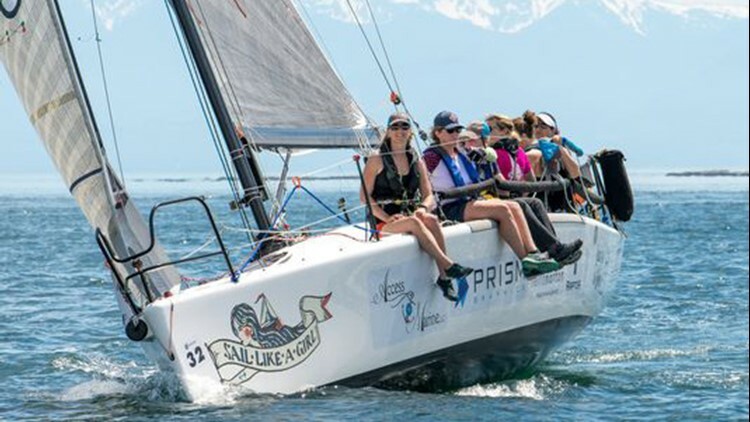 Sail Like a Girl plans to put the race’s $10,000 first-place prize towards the Pink Boat Regatta, a charity sailing race that donates proceeds to the Breast Cancer Research Foundation. The team is also fundraising by selling t-shirts on its website. The goal is to inspire other women, “to be courageous, take leadership roles,” Goussev said. While Sail Like a Girl’s crew celebrated victory, another Bainbridge Islander watched from home. Steve Rhoades, an ex-Marine who battled alcohol drug addiction, had planned to tackle the race alone, paddling to Alaska on his long board. Rhoades was forced to drop out of the race on the first day because of injuries. Rhoades is an ex-Marine who has been sober for 16 years. He planned to use his journey to Ketchikan to raise money for his street ministry, reaching out to homeless veterans. A large crowd of supporters saw him off from Bainbridge on June 8. Rhoades was nearing Kingston when he decided to go to land and repack the board. In a moment, he said he felt like his hip was about to pop out of place. “Right then I knew I have to bail,” he said. Quitting early was the last thing he wanted to do, but Rhoades said he knew braving the treacherous waters on the way to Alaska could put more people than him in harm’s way. “Your ego is not your amigo,” Rhoades said. Rhoades still drove to Port Townsend and started the race with the rest of the competition. He paddled out to the lighthouse before turning around and cheering on other racers. It was a disappointing finish for Rhoades, who had hoped to raise $15,000 for his ministry. The plan is to set up a mobile soup-kitchen that he will service the north end of Kitsap. After dropping out of the race, he shut down the fundraiser and offered to refund any donations he received. Only one person asked for their money back. “And she said, ‘I want to support Steve on his next adventure,’” Rhoades said.